Today, many tragedies are happening around the world. We are facing moral challenges that will determine our future, for better or worse. Tragedies keep occurring due to our lack of understanding toward differences, particularly the religious ones. Religion today is believed to be a political tool used to dominate and to determine who’s right and who’s wrong. Unlike today, religion in ancient time was practiced as guidance for humanity to accomplish human virtue that separates the right from wrong. Having said that, we would like to invite you to revisit the meaning of religions and their differences, through history of an era in which differences were embraced to elevate civilization. The following article discusses about the time when religions used to gave us music, mutual respect and cross enrichment, while today religions give us nothing but hatred, terrorism and war. The history of guitar is still inconclusive. Guiterre morische, guitarra latina, and vihuela from 13th and 14th century are still considered the embryo of the guitar as we know it today. Guiterre morische belongs to the family of lute, which known in Indonesia as gambus. This instrument evolved from oud, a musical instrument brought by the Moors when they dominated Andalusia, Spain, in the 8th century. Of these three instruments, guitarra latina is believed to give the biggest influence to the birth of guitar, and therefore regarded as the direct ancestor of this popular instrument. Many historians consider string musical instrument (chordophone) as the earliest form of guitar. Images of this instrument were carved in reliefs believed to be made in 1350 BC in a Lesser Asia region, known today as Turkey. The image of ‘guitar’ was, again, drawn in a set of prayer and psalter books from the Carolingian era in the 9th century Europe that covered the area of present-day Germany and France. Records from the 13th century churches contain more mentions and drawings of guitar. If chordophones are to be considered the embryo of guitar, then it is safe to say that guitar is a result of an evolution that spread across numerous civilizations in the span of 3000 years! The term guitar is borrowed from the word that has gone through an incredibly long journey; from the Greek word khitara, Latin word chitara, and Arabic-Andalusia word qitara, which further evolved to guitarra, a Spanish word, and eventually adopted by English as guitar, French as guitare, and German as gitarre, and Indonesian as gitar. Regardless when guitar exactly began to evolve, there is one era in history responsible for the birth of guitar: the Islamic Caliphate in Iberia Peninsula that stretched from the 8th to 13th century, centered in Cordoba, Andalusia, Spain. In the beginning of 8th century, the Moors brought and introduced the oud when they occupied Cordoba. Oud is originated from Arabic language, al-ud, which essentially means wood. This word transformed to alaud in Spanish language, which further transformed to lute in English. This word transformation was also followed by the transformation of the instrument: the shape, sound, and construction. Unlike oud, lute has frets on its neck. Oud was part of ancient string instruments that has been played since the Mesopotamia era, between 1600 – 1150 BC, within the region that today includes Irak, Turkey, Syria, Egypt, and Iran. In the 500 years of Islamic Caliphate period, Andalusia became one of the centers of civilization that brought about numerous discoveries and new thoughts in various fields such as science, technology, architecture, and art. Cordoba became the world’s center of intellectualism. Even though discriminating acts existed, such as special tax implementation and social status hierarchy, the life of the followers of the three divine religions was considerably peaceful and went on without violent conflicts. In fact, in many ways, they ended up empowering one another, as shown in the architectural designs and arts created within this period. Mezquita-Catedral de Cordoba (Cordoba Mosque-Cathedral) doesn’t only show how two different architectural styles can be combined, resulting in a unique, amazing building; it also shows how people of different faiths could live in peace and harmony. This building was originally St. Vincent Church, a remnant from Visigoth period. Abdul Rahman I, who acted as the new ruler, gave permission to the Christians to rebuild the church that was damaged during the war. He also bought a half part of the land and transformed it into a mosque. Once the renovation finished, the people of the two faiths carried out their respective rituals side by side in the same area. The prayer area continued to be expanded into one building complex of unmatched architectural design. 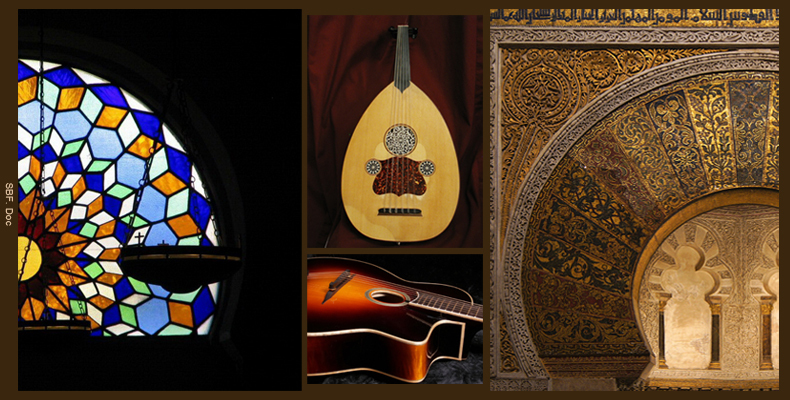 The Moors’ musical instrument, oud, also experienced some transformations. Oud itself has evolved into a modern Arabic oud and became the icon of musical instrument in Middle East. Its popularity eventually reached Indonesia, where it was evolved into gambus. The evolution of oud significantly contributed to the birth of guitar’s predecessors, such as guiterre, gutrarra latina, vihuela, and lute. In the eve of its golden era in 12th century, Islamic Caliphate still gave its contribution to the architectural design, which later called the Mudejar architecture. This style reflects the combination of both Islamic and Christian cultures and it continued to give influences to Western European culture until the 18th century. One masterpiece created in this period is the famous Alhambra in Granada, Spain. Even though the approach to the design is said to be started in 12th century, its unique style had already began to grow since in the beginning of the 8th century in Cordoba. Mudejar is a borrowed term from the Arabic Mudajjan, that means: those who remained. Mudejar is also used to name the Muslim community that remained in Cordoba after the conquest of King Ferdinand III. They, just like the Jewish, were granted a special autonomy in the region and allowed to retain their faiths until the end of 16th century. Out of the political, social, and cultural conditions of the Caliphate period, a new era was born in Europe, known as Renaissance era or The Age of Reasons that eventually brought the world to the new order, under which we live today, and this period gave us the guitar. Guitar is the proof that humans were once lived in an era where culture was held in high regard. Since then, the world has seen countless remarkable inventions that might amaze our ancestors if they could live to see it. With that said, all those achievements are useless and meaningless if we can’t even surpass (or even only to match) our ancestors’ refined culture that they had achieved for hundreds of years, more than a thousand years ago. Guitar and music can remind us that, initially, it was faith, beliefs, and religions that brought about “music”. It seems impossible to find a human being that has never been in contact with music. Ironically, many people have become closer to (and praise) music but only to walk away from the faiths that gave us music. This article was originally written as a foreword in the program brochure of “MUDEJAR: Classical Guitar Homage Concert to Interfaith Cohabitation” – an event presented by Listen to the World at the Cathedral Church and Grand Mosque Istiqlal, Jakarta, Indonesia, on September 14 & 15, 2013. I used to play guitar for about 10 years, and this article makes me aware about how to respect and believe in this beautiful instrument. Keep up the good work Le Junun! Beautiful history! I wonder why the harmony of these religions ended? Is because the evolution of man’s intellectuality “fragile”?